Copyright © 2011. Benefit Plan Systems Corporation. All Rights Reserved. 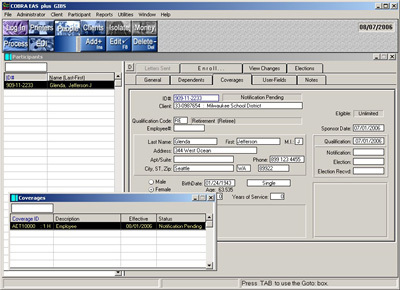 COBRA EAS plus GIBS combines both COBRA and Direct Bill participants into one data file. The advantage is that you do not need to leave one system and bring up another to complete actions. This is the version you would want when the same people handle both COBRA and Retiree participants. All activity is automated to the fullest extent possible to assure that your personnel costs will be as low as possible. Of Absence, Sabbatical or any other. There are virtually no limits to the number of rates, plans, participants or other maintenance data that can be put into the system. Create multiple divisions with unique administration parameters. You can easily connect this system to your HR or other system to fully automate import/export and electronic eligibility reporting to carriers. Built-in scripting functionality lets you run processes automatically on any time and day schedule that you set. Add EASWEB to exchange real time data between your company, your divisions, brokers, participants and other authorized parties. COBRA EAS plus GIBS can be completed integrated with all other EAS suite applications.